This series travels the globe to show travelers what not to do with tiny creatures that pack a hefty punch. Whether it is an acid-spewing ant or an explosive beetle, Dr. Mike Leahy is on the lookout for the creepiest crawlies in this action-packed four-part series. Scouring the globe for some of the most advanced killers in the animal kingdom, Mike proves that size does not matter when it comes to posing the biggest threat to humans. Under the watchful eye of medics Mike endeavors to understand the science behind their secret weapons, and highlight how to avoid an unwanted close encounter. A doctor of virology by trade, Mike climbs a 30-meter mountain of cockroach-infested bat guano in Borneo and gets knee-deep in mud in search of tiny lethal creatures. He also gets up close and personal with nasty parasites, triple-threat lizards and a frisky fish able to weave its way right up into a human’s urethra. Virologist Mike Leahy takes a trip to Brazil, to explore the thousands of possible health hazards. Dr. Mike puts his body on the line as he examines fire ants and invisible worms, plus the legendary candiru fish. Join Dr Mike as he braves India's wildlife, confronting rare bloodthirsty monkeys and investigating bugs which hitch rides in people's stomachs. 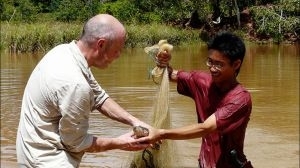 Virologist Mike Leahy heads to Vietnam where he examines the potentially harmful creatures, cities, jungles and paddy fields. Join virologist Dr Mike as he braves the Australian Outback and takes on some of its most potent wildlife, including an eight-legged murderess. Dr Mike Leahy travels to Borneo where he learns the hard way that everything is out to get you, whether trekking through the forest, climbing a mountain, exploring a 65 million year old cave system or cruising through the mangrove swamp. From the dense tropical rain forest to the natural wonder of the Great Barrier Reef, Queensland Australia is an idyllic travel destination. It's also home to beautiful yet deadly creatures. From a nettle on steroids to a killer bird, globe-trotting virologist Dr. Mike Leahy meets some of the smallest yet most lethal locals in this sun lover's paradise. Mexico is virologist Mike Leahy's dream destination. This exotic North American country is home to a host of tiny terrors whose size defies their capacity to damage your holiday plans - and your insides - in an instant.